Here’s a particularly good beginning close-up card magic trick that’s easy to learn and perform, encourages interaction from spectators, has some built-in humor and a plot twist, is perplexing, and builds to a fun conclusion and revelation. You’ll have to gimmick and dedicate a deck of cards for this effect and routine. You’ll be writing on the backs of the cards and ruining the deck for any games or other tricks, but that the results are well worth it. This trick is a mind-reading routine that turns into a prediction. A deck of cards - you’ll want a red or light colored back on the deck that will allow you to write a number that is easily seen. Generally, blue-backed decks won’t work for this. You’ll be gimmicking the deck in such a way that a spectator will always select a card with a certain outcome. This easy magic card trick requires no sleight of hand. A bit of sleight of hand in the form of an overhand shuffle or Hindu shuffle will greatly enhance the effect. In this step, you need to sort the deck in preparation for the gimmicking. Deal the cards face up into piles by value, for example, aces, two, threes and so on. You’re dealing the cards and creating 12 piles of four-of-a-kinds. Sorting the deck into two piles. Split each four of a kind and put two of each value into a pile. For example, take the four aces and put two of them in one pile and remaining two in the other pile. Repeat with all of the four-of-a-kinds. Try to be random with the suits. You don’t want all hearts and clubs in one pile and all diamonds and spades in the other. You’re aiming for a distribution of all of the suits in each of the two piles. At this point, you’ll have two piles of cards with a mixture of the values and suits. Each pile is half of the original deck and should consist of 26 cards. You’ll need to decide on a force number. For the purposes of this explanation, we’ve chosen the number “eight.” You’re free to choose whatever number that you wish, but if you want to maintain the humor in the patter and presentation, you’ll want to choose a number that’s ten or under. This way, you’ll seemingly indicate a value for a playing card. This will make more sense later. Take your marker and for all of the cards in one pile (half of the deck), write different, numbers on each of the backs, between “one” and “52," but don’t write “eight” on any of the backs in this first pile. Try not to repeat numbers and do this with all of the cards in the first pile. Marking the Deck - Step 2. 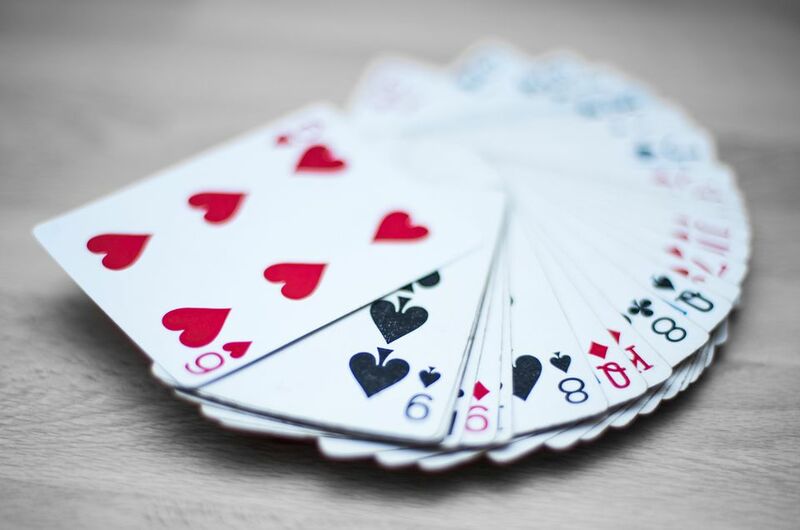 Take the second pile - half of the deck - and write “8" on the back of each. The Deck is ready for the trick. You can put the deck back into its box or simply wrap a rubber band around it. Let the spectator select a card. Bring out the deck from its box and try to keep the cards face-up and not show the numbers on the back. Run through the deck displaying the faces of the cards, show that they are different. At this point, you can perform an overhand or Hindu shuffle. Just be sure to only mix the top half of the face-up cards so you don’t mix the random numbered cards with the force numbered cards. While the cards are face-up, display some cards and ask a spectator to mentally select one. In this example, we'll assume that the spectator mentally chose the "queen of hearts" which is among the cards that are displayed. Show the backs with different numbers. Close up the deck and tell the spectator that you will read his mind. After a bit, ask if it’s the number “eight” (or your force number if it’s different). When the spectator says “no,” turn the cards over, face down, and show the numbers on the backs of each card. Deal the cards onto the table and show the face of each card showing that each has a number. Do this for ten or so cards. Don’t go too far (past 25) or you will get into cards with “eight” on the back. Note that there’s a slight chance that a spectator will say “yes” when you ask if it’s an “eight” (he actually chose an “eight”). This is no problem. Simply go to the step where you show the backs of the different numbered cards. The spectator reveals his mentally selected card. Ask the spectator to name his card. Turn the deck over, face up, and at this point, you can execute a Hindu or overhand shuffle - maintaining the top half of the deck - if you like. Reveal the number on the back. Turn over the card and reveal the “eight” written on the back. You were correct. To end the trick and “clean-up,” simply replace the card (“queen of hearts” in this example) face-up onto the top of the face-up deck, and put the cards away.